An old train-car bridge just South of Franklin Ave bridge. 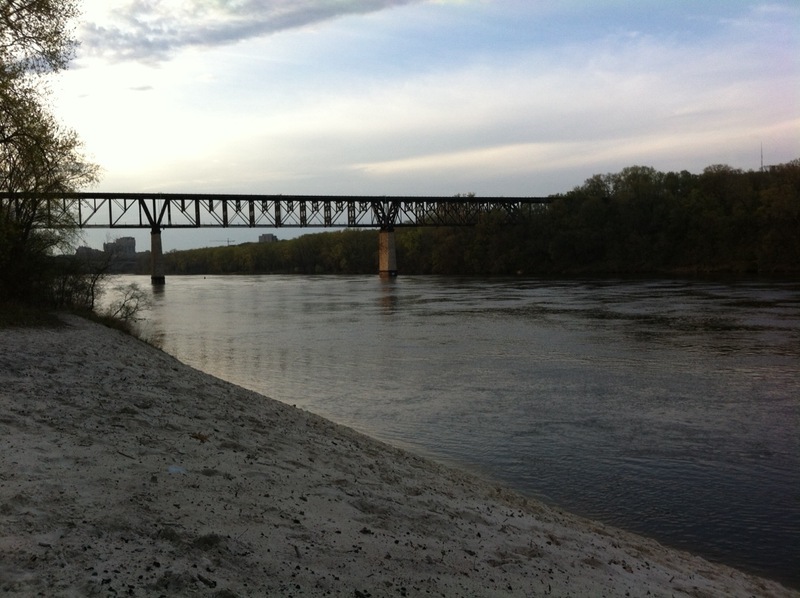 There is a pleasant walk called the Winchell Trail that runs parallel to West River Parkway. This beach is at the end of the trail. Hello friends, it’s a rainy Spring day here in Minneapolis. This early evening, I took a long walk along the bicycle greenway and am happy to say that the leaves have finally arrived. My old forest biology professor used to call it “Christmas in Spring”, since all the new leaves are a bright green, popping color here and there similar to christmas lights. Well, this last month has been fun-packed mostly with art related activities. 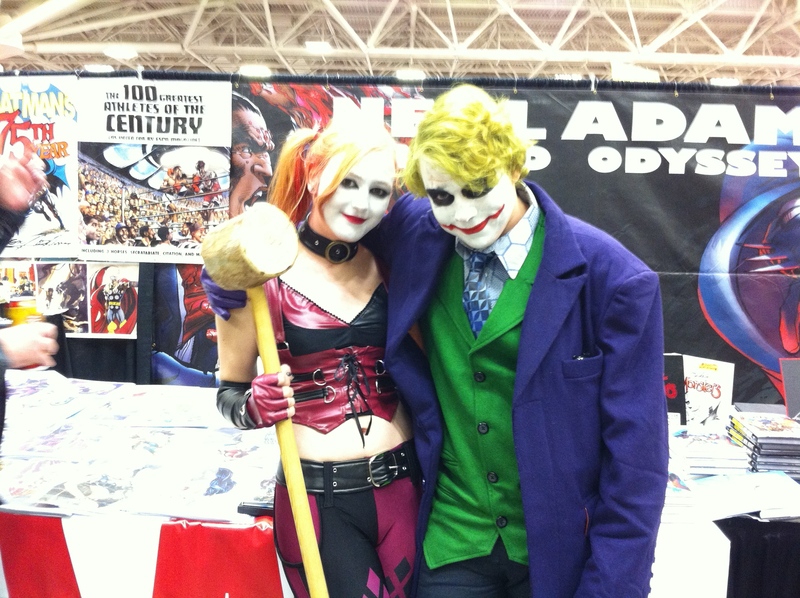 It all started with the Minneapolis Comic-Con – Wizard World, which was hosted in the Convention Center. My brother and I had always wanted to go to a Comic-Con and we were happy to find out that one was passing through our hometown! So, when the day finally arrived, I put on my storm-trooper helmet and caught the bus with my bro towards downtown. When we arrived, I was pleasantly surprised to see multiple dwarves, elves, and people in nerdy shirts hanging out in front of the entrance. The time had come for the nerds and dweebs of the Twin Cities to congregate and become one super-geek collective. 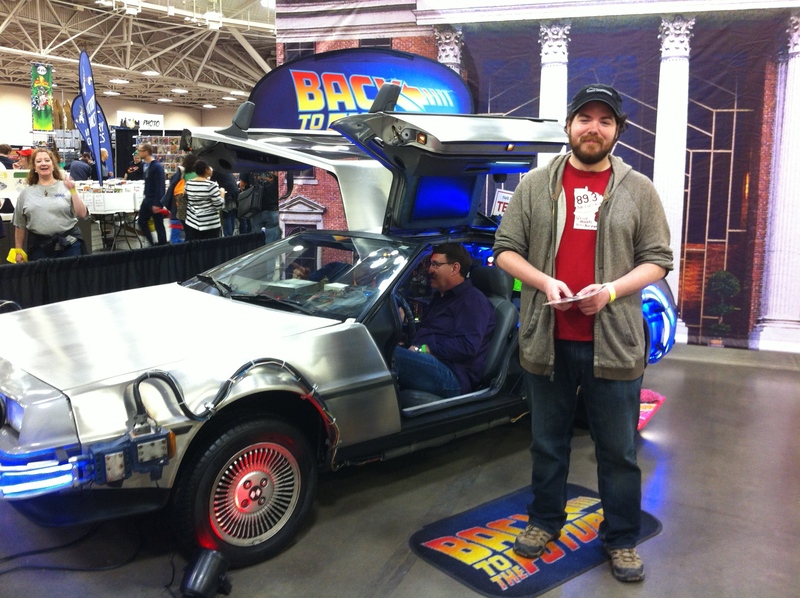 As we entered the Convention Center, one of the first things we noticed was a DeLorean from Back to the Future. Jamie was lucky enough to get a picture with it. We looked at the map and decided to go from right to left, looking at all the stands as we walked along. While walking, you could hear an ocarina vendor playing Zelda songs on his personal ocarina, comic collectors haggling with the vendors for cheaper prices, and the normal chitter-chatter of people discussing their comic based interests. Jamie and I entered some stands to look at the board games and/or action figures, but what we really wanted to see was the talented artists. 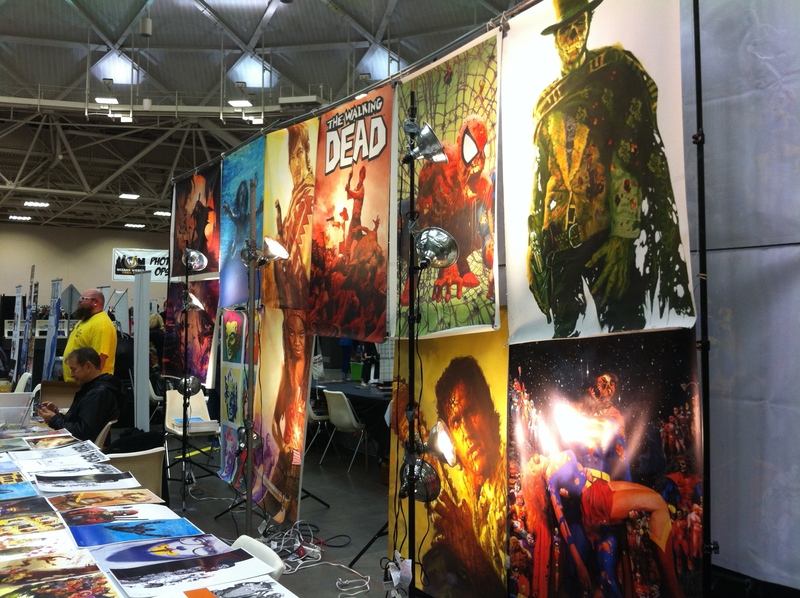 There were hundreds of tables with comic artists and each of those tables had many prints and comics to see. One of my favorites was an artist veteran from Filmation, which is a production company that produced some of the best cartoons ever made, such as He-Man, Looney Tunes, Start Trek: The Animated Series, and, of course, The Adventures of Batman. Okay, okay, I maybe exaggerating about these cartoons being the best ever made, but they are hilarious to watch! “Holy Comi-Con, Batman!” (Did you know there is a list of Robin exclamations on Wikipedia? One of the last things Jamie and I did was look at the actors that were signing autographs. I didn’t realize that it cost so much money to get an autograph! Adam Baldwin was signing for $40, Gilbert Godfrey was the same, Lou Ferrigno was $35, and William Shatner was $100-$200. I didn’t get an autograph, but I got to see the first three. Shatner was hidden behind a velvet curtain (so, Shatner). There were many more actors as well, I just didn’t recognize where they were from. Overall, I had a great time at Comic-Con and I look forward to going next year. My favorite cosplay of the day. Let’s take a break from comics and talk about Art-a-Whirl, which is hosted by the Northeast Minneapolis Arts Association (NEMAA). Art-A-Whirl is the largest open studio tour in the country and it’s a one of the only times of the year where almost all of the private artist studios and galleries are open to the public. Before I delve into Art-a-Whirl, I’ll give you a brief history about NE Minneapolis. Traditionally, Northeast Minneapolis is known for its Scandinavian and Eastern European working-class immigrants. “They were drawn into the area first by employment opportunities that the grain mills and sawmills along the river offered, and later by rail and factory jobs across the city. By 1930, immigrants made up nearly 60% of Northeast’s total population.” (Wikipedia). Even today, you can still see Kramarczuk’s Sausage Company, Sentyrz Liquor & Supermarket, and Nye’s Polonaise Room. I believe the history of NE Minneapolis is important for understanding Art-a-Whirl because then you can recognize that historically working class families lived in this neighborhood. So, it would make sense that artists would be attracted to an area where studio space is cheap and prevalent, due to the abundance of vacant warehouses, an example being the Northrop-King Building. Over the last 30 years, artists have been revitalizing the NE community, resulting in business growth and a thriving restaurant scene. While walking through NE, I saw flatmates on their balconies sharing beers, young families playing with their children on their front lawns, and cafes filled with students, writers, and artists working on their latest works. It’s a lively place, which is the reason why Art-a-Whirl is held in this neighborhood. It’s a weekend event, so Friday evening, I got off work and decided to take a walk around the NE neighborhood, looking for open-houses and food. In one of the several nooks of the neighborhood, I found a Harriet Brewing stand selling beers on tap and a Polish hotdog stand just beside it: Yes, please! There was music too, so I spent a good part of my night eating, drinking, and listening to the music. After, I walked to my friends/co-workers house, who was hosting a gallery by Joshua Nelson. Josh is a photographer and paper artist and he uses paper to make intricate scenes, such as a hand holding a beehive. It was a cool gallery, you can see more at his website. The next day, I met up with my family and we toured a family-friends gallery called 2001: A Space. His name is Dean Hawthorne and he’s a welder and freelance fabricator. (Oddly enough, he is also the announcer for Midwest Mountaineering’s Outdoor Expo, which I wrote about in a past entry: small world!). He has a small space, but it is full of fun pieces, such as bike racks and other metal artwork. I liked his night-time scenes the most. The next gallery we visited was at Chris Kelly’s house, who is a glass blower. My Mom works with glass, so she knows Chris and has other connections with the glass artist community. We first went into his side yard, which had a bunch of glass art for sale from a different glass artist. I bought a Mason jar that is filled with colorful glass and has a solar powered LED light, which I now use in my backyard to lead the way to our fire-pit. As I entered the glass studio, I saw that they had some home-brews on tap. I filled my reusable cup and continued on my way to the backyard. 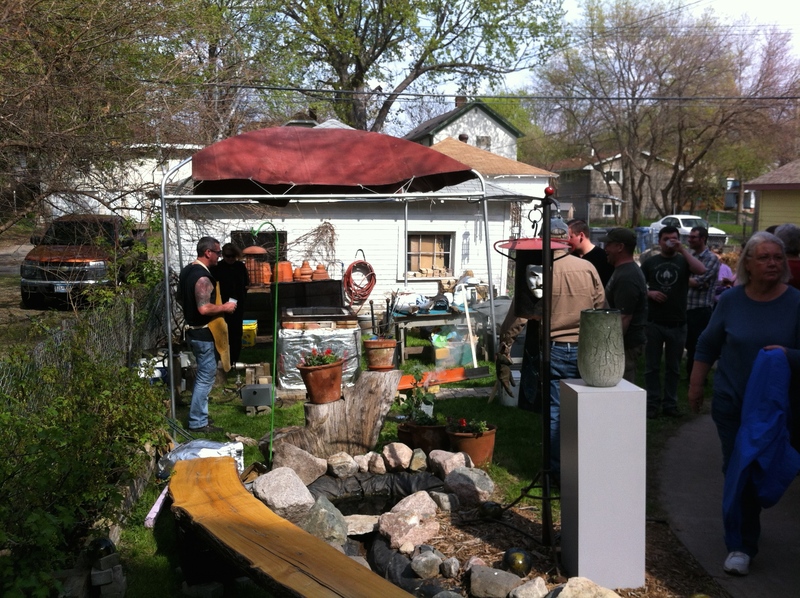 In the backyard, there was a metal casting demonstration. Right when I got there, they were transporting the melted metal into a mold. It was cool to see metal in its liquid form! After, I walked inside his house to find glass art everywhere. The lights had hand crafted glass covers, the walls were covered in colorful glass, and the food was held in beautifully made glass bowls and plates. It was almost overwhelming! There were other glass artists selling their jewelry inside, even one of my Mom’s glass teachers. When we were preparing to leave, I heard there was a glass-blowing presentation happening in the studio, so we walked over to find an apprentice working on a glass vase. I had to put my sunglasses on to watch him continually turn the molten vase in the kiln. I’m glad I got to see a glass blower in action, it would’ve been a pity to miss out of such a interesting presentation! You’d think I’d had enough of the art scene of Minneapolis, but I wanted to go to one more event that was being hosted the same weekend as Art-a-Whirl. 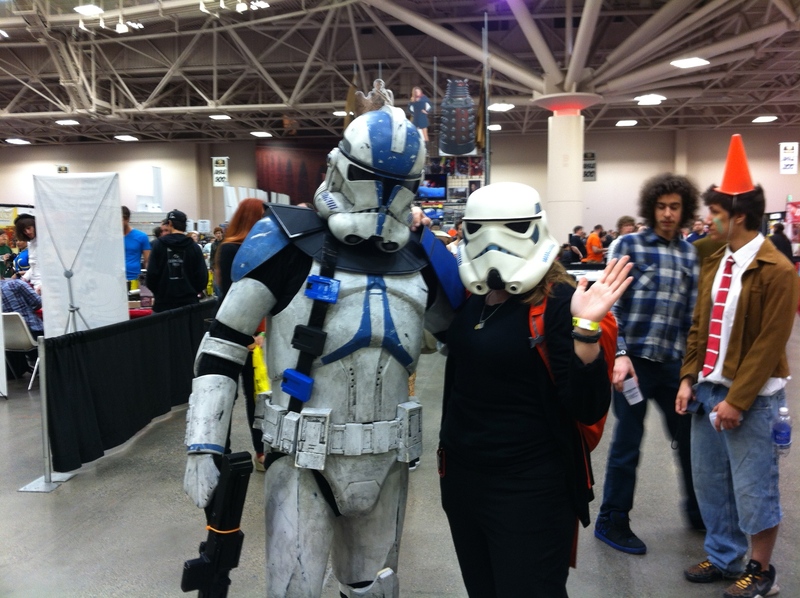 This event in called Spring-Con, which is the local Twin Cities Comic-Con. 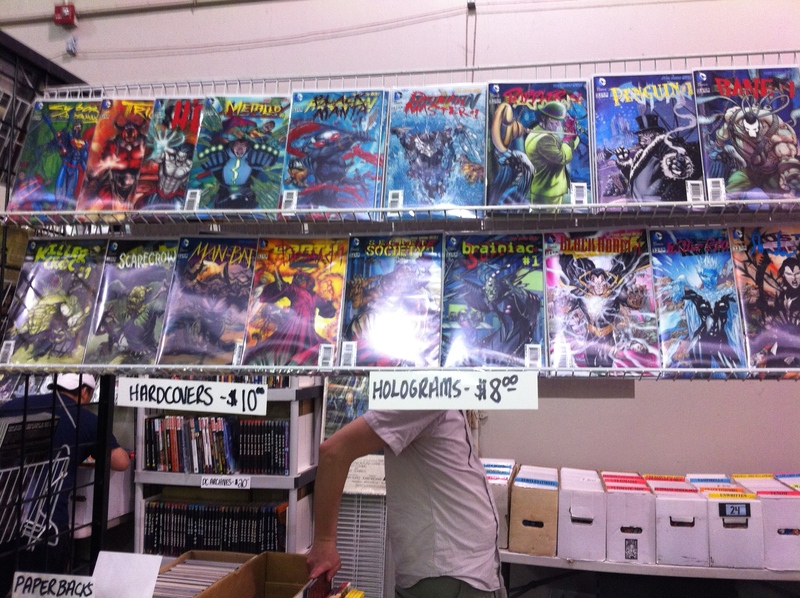 It’s very similar to Comic-Con, but with a focus on our local artists and more importantly, getting the not-so-well-known artists of Minneapolis out into the Comic market. Similar as before, I went with my bro to the State Fair Grounds, which is where Spring-Con was being held. 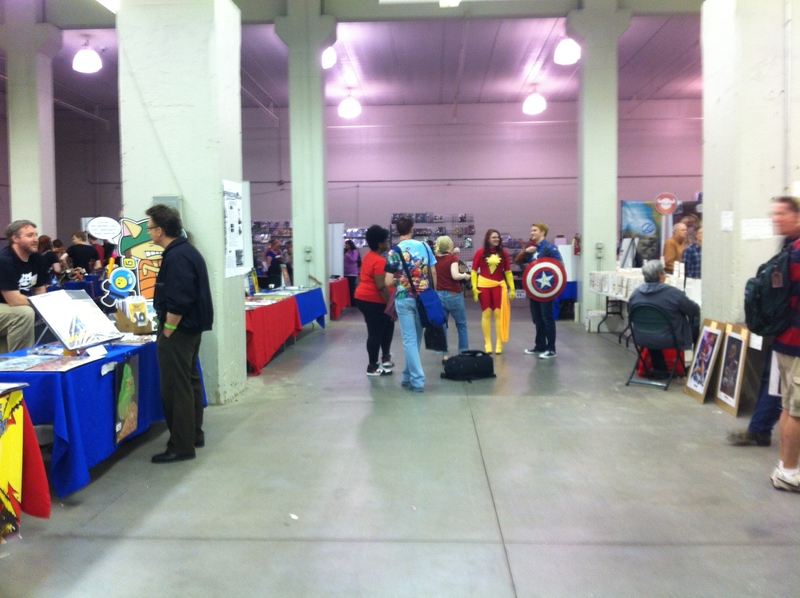 We walked inside to find lots of talented artists selling their prints and comic books. I found some of my favorite artists from Fall-Con such as Drew Brockington. You can see his art at www.cannibalrainbow.com. I also found new artists who I liked very much, such as Thomas Boguszewski who you can check out at ThisisArtinProgress. Overall, It was a wonderful time checking out the art and talking with the local artists. Seeing all these young artists inspires me to draw more and to work even harder of my personal projects. Thank you Midwest Comic Book Association for hosting this fun event. Well, this has been my art-packed life. Thanks for reading. For my final art plug, here is my brother’s tumblr: Chubodactyl. (You can see his drawing above). ← Mongolia: A Journey to the West. A short film.